Description In 1870, the Dutch-born, Belgian-trained artist Alma-Tadema moved to London, where he found a ready market among the wealthy middle classes for paintings re-creating scenes of domestic life in imperial Roman times. In this work, however, he turns to early Greece to illustrate a passage by the ancient Greek poet Hermesianax (active ca. 330 BC) preserved in Atheneaus, Deipnosophistae, "Banquet of the Learned," book 2, line 598. 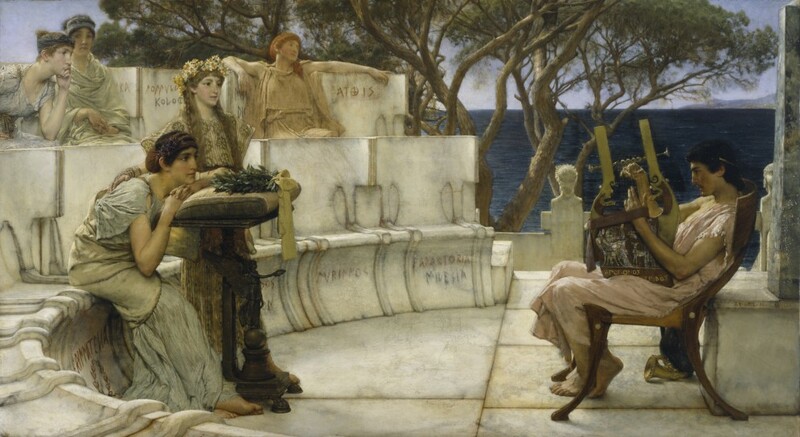 On the island of Lesbos (Mytilene), in the late 7th century BC, Sappho and her companions listen rapturously as the poet Alcaeus plays a "kithara." Striving for verisimilitude, Alma-Tadema copied the marble seating of the Theater of Dionysos in Athens, although he substituted the names of members of Sappho's sorority for those of the officials incised on the Athenian prototype. Victorian Painting. The Fine Arts Society, London. 1977. Empires Restored, Elysium Revisited: The Art of Sir Lawrence Alma-Tadema. Amsterdam: Van Gogh Museum, AJ Amsterdam; The Sterling and Francine Clark Art Institute, Williamstown; The Walters Art Gallery, Baltimore; Taft Museum of Art, Cincinnati; The Dixon Gallery and Gardens, Memphis. 1991-1992. Victorians: British Painting in the Reign of Queen Victoria, 1837-1901. National Gallery of Art, Washington. 1997. Howard Pyle and the American Renaissance. Brandywine River Museum, Chadds Ford. 2007. Provenance William T. Walters, Baltimore, after 1881, by purchase [Deschamps as agent]; Henry Walters, Baltimore, 1894, by inheritance; Walters Art Museum, 1931, by bequest.